Odeya Rush and ‘Spider-Man’ lead Jacob Batalon will also star in the holiday feature. Netflix has assembled an impressive list of young talent for its holiday feature Let It Snow, based on the young adult best-seller from John Green, Maureen Johnson and Lauren Myracle. Chilling Adventures of Sabrina headliner Kiernan Shipka and Shameik Moore, who starred in the streamer’s series The Get Down, are part of the ensemble, along with Instant Family actress Isabela Moner. Jacob Batalon (Spider-Man: Homecoming), Miles Robbins (Blockers), Mitchell Hope (Descendants), Liv Hewson (Santa Clarita Diet) and Anna Akana (You Get Me) are also set for the movie. Joan Cusack rounds out the cast. The logline for the rom-com anthology reads: When a once in a century snowstorm hits a small town on Christmas Eve, several high school seniors discover unexpected opportunities as well as complications that test their friendships, love lives and aspirations for the future. Luke Snellin will direct from a script by Victoria Strouse (Finding Dory), the latest screenwriter on the project that was previously set up at Universal. Bird Box producer Dylan Clark will produce via his Dylan Clark Productions, along with Alexa Faigen. Beau Bauman will exec produce with Brendan Ferguson. 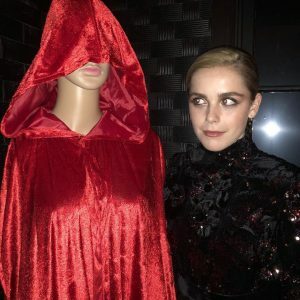 Shipka, who will be seen in the second season of Sabrina, is repped by CAA, Anonymous Content and Sloane Offer. Moore, repped by CAA, Three Six Zero and McKuin Frankel, is currently in theaters with the massively popular animated film Spider-Verse. Moner stars in Paramount’s upcoming Dora the Explorer movie and is repped by CAA and Peikoff Mahan. 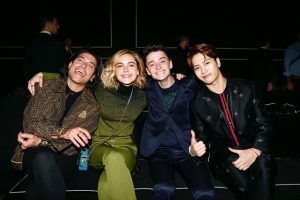 Kier hopped a plane to Italy to see the Fendi men’s fashion show and slayed! The first images are in the gallery – click the image below to see the rest! More to come! It’s a New Year and Shipka.net is working hard at updating the galleries for your enjoyment! More interview screencaps, event images and candids have been added! Check it out! 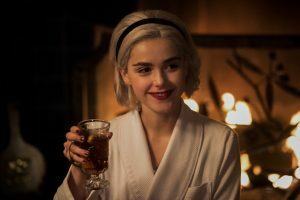 The awesome news is that Chilling Adventures Of Sabrina has been picked up for TWO MORE SEASONS! Season two will be dropping in April and filming for the third and fourth seasons will begin sometime this year! While there hasn’t been any official news on the release of The Silence – rumors as saying it will be released in the next few months. Why the hold up? Well the company that made the movie kind of went bankrupt so there are a few films having issues, Kiernan’s horror flick is just one of them. Expect big things and big updates! Also if you are interested in being a part of the Shipka squad send us a message on Instagram! Season Two Of Sabrina Gets Release Date! 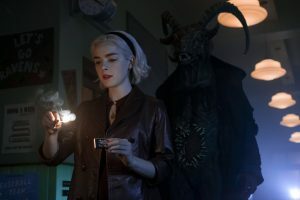 Mark your calendars witches – season two of Chilling Adventures Of Sabrina comes to Netflix April 5th 2019! Check out the teaser trailer below! Holiday Special Of Sabrina Coming At You This December! Those of you who are eager to see more Sabrina won’t have to wait too long – December 14th Netflix will be releasing a Christmas Episode that will also feature McKenna Grace as an itty bitty Sabrina!